Things are finally starting to click. I am discovering for the firs time the joy of seeing the universe through binoculars. I found not one, but two comets in the sky this morning! My original plan was to get up and set out the Yard Canon to get up close and personal with Lovejoy (now that I “know what i’m doing” lol). However a couple factors played against that goal. First, it was about 27*. Second, it was a pre-dawn observing session following a very long day caring for a sick family (including a 2 year old that kept me up most of last night). Third, and probably most important, was the constant 15-20 mph wind howling out of the north. I have tried to observe in the lee of the house under conditions like this in Texas (not so cold, of course) and barely escaped with the light bucket intact. As fun as trying to get musical notes out of the telescope by pointing it perpendicular to wind would be, I opted for binoculars again and went outside into that starry landscape that blows me away every time I see it. In fact, as I rub my bleary eyes (damn you Nyquil, this is supposed to be a non-drowsy, daytime formula…) I’m still shaking my head at the thought that I never considered binocular use as a worthwhile pursuit in astronomy. Oh sure, I’d glanced at the crescent moon before and grinned when I realized that I could see the Galilean moons around Jupiter in binoculars, but that was about all I’d ever used them for (other than birdwatching and defending the bird feeder from squirrels). But today, I purposely scanned the sky a bit before settling down to find comets and objects like the Pleides, M42 and M44 just blew me away….and the best feeling of all (that excited, tingly, impatient for clear skies, new scope on the way feeling!) is knowing that I have barely scratched the surface of binocular astronomy. I stepped out—ostensibly to take the garbage to the curb—and spotted a globular cluster of thousands of stars in a clump–like someone threw a snowball into the sky and it hit a window and stuck, a group of young stars still shrouded in the gaseous nebula in which they were born, the Great Nebula in Orion (always a favorite)….and all in about 5 minutes, with no set up time, no collimation worries, no stressing over thermal currents….in short it…was…awesome. Can you tell I’m going to go back and read all those binocular columns in my astro mags that I habitually (till now) skipped as irrelevant to me? Everything I’ve mentioned were pure targets of opportunity. The real mission was to find comet Lovejoy (2013 R1) again and any of the other 3 bright (relatively speaking) comets out there. And I can happily report I finally got ISON in binoculars! Finally! The show stopper comet the media has hyped for a year was finally in my grasp. And what did I think??? 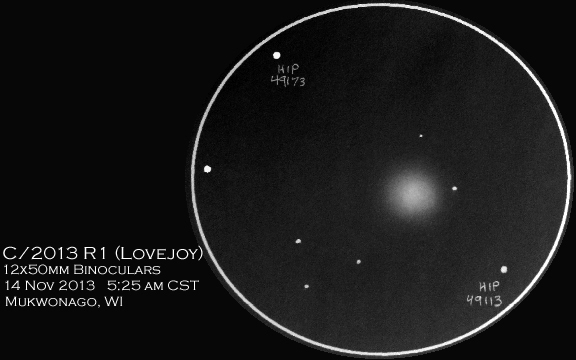 Lovejoy is MUCH more impressive and easy to find. When you see Lovejoy, you KNOW you’re looking at something in between you and the light-years-distant stars in the great inky sea of the sky. 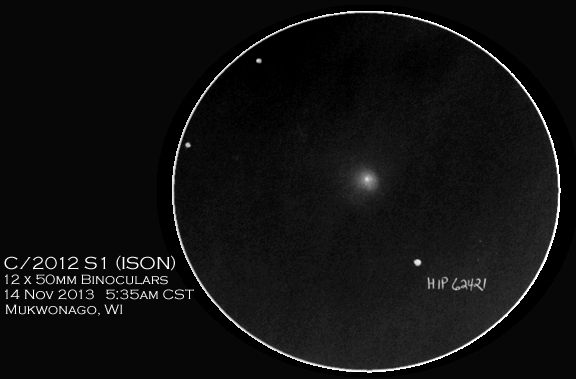 ISON is just a bright-ish star with a bit of a halo. The comet seemed smaller, brighter today, but it was still very easy to catch. I almost pointed the binoculars right on top of it, actually on the first pass. Does that mean I saw it naked eye and subconsciously positioned the binoculars right on target? Maybe. But I don’t recall seeing even a fuzz of light with just my eyes. At any rate, it was clear the comet had moved…the star field, while still showing a few triangle asterism, was not the same as it was yesterday. That is cool—first time I’ve ever tracked a moving object like this on consecutive nights and seen actual movement. Big difference. ISON was about half the size of Lovejoy, and it has a bright star-like nucleus, where Lovejoy is just a diffuse puff-ball. 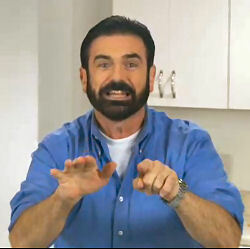 It was still very obvious, when I looked, and I didn’t need averted vision. As I swept the FOV around, I landed right on it. Knowing that this comet was in the same vicinity yesterday, yet I could find no trace of it, I have to say, I think (in my oh so humble and inexperienced opinion) that this thing is finally starting to brighten.